You’ve probably seen some green roofs around and about – many people top their sheds or bike shelters with a living canopy, while others go the whole hog and turn the roof of their house into a green zone. Apart from looking great, what exactly are the benefits to a green roof, how much work is it to create and, most importantly, how much does it cost? We can’t deny that climate change is happening and that our towns and cities are major drivers. Not only do they develop in places where it all used to be fields, but they also kick out an unnatural amount of heat – the so-called urban heat island effect. Covering over large areas with tarmac and concrete isn’t great for flood defence either, or for wildlife. A great answer, then, is to grow plants on top of these urban structures. These living roofs absorb CO2 and help to filter out particulates, they offer a habitat for insects and birds, they transpire water so the urban heat island effect is mitigated and they take in rainwater, helping to prevent floods. What’s not to like? This is very true, there is some work involved in creating a green roof. If you’re covering a small area, like the top of a bike shed, then it’s no more than a day or two. You’ll need a secure waterproof membrane, then some gravel, then some coarse soil or sand, topped off with topsoil. You need, of course, a frame to keep everything in place, but if you’re handy with a hammer, you can do this yourself. 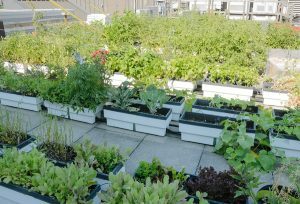 Bigger roofs have to be done by professionals and the more complex the job – steeper roofs and/or more biodiverse planting – the more it’ll cost. On average, you can expect to pay between £100 and £140 per square metre. The average roof in the UK is around 50 square metres, so you’re looking at £5,000 or so. However, this roof provides extra insulation and it also protects the roofing material underneath it, reducing the need for repairs and replacement. Copyright for the image within this blog post is owned by ‘Alison Hancock’, and has been licensed for use on this blog post through Big Stock Photo (stock photo ID: 34944623). For questions relating to this image please contact the copyright owner directly.